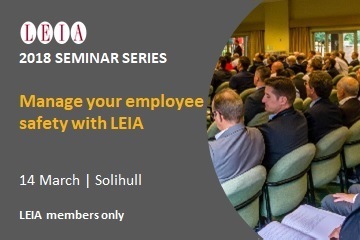 We are pleased to launch the LEIA Seminar Series for 2018, commencing with our Safety Seminar – Manage you employee safety with LEIA. As well as a presentation on escalator safety by Mark Truelove, ex-ThyssenKrupp, there will be a presentation on the development of the LEIA 10-year Competency Plan. In addition, you will be able to ask questions of a CDM consultant on the implications of acting as a Principal Designer.